Ekos_brewmaster was started with the intention to support the craft industry. In just three years, the company works with over 1000 beverage companies around the world. Cloud based, ekos_brewmaster being used on the production floor for craft brewery. ...we are here to walk them through process to help them scale their business. In only three years, ekos_brewmaster has hit over 1000 craft beverage customers across the country and internationally. Ekos_brewmaster was started with the intention to support the craft industry, by creating an affordable brewery management software. With this being their goal, ekos_brewmaster started targeting the craft beer industry. Since their start, they have taken on other craft beverage makers and plan to customize the ekos_platform even more in 2018. 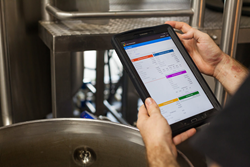 With the frustrations of managing inventory, streamlining brewery production processes, understanding financials and the sales cycle – craft brewers needed an easy to use, one stop shop to organize and manage their brewery in. Ekos_brewmaster helps brewers do just this. Ekos_ focuses on four key areas of a craft business – operations, production, accounting and sales. With these at the top of the priority list, they make it easy for the craft to customize their ekos_platform to fit the brewery’s needs. Not only do they offer these functionalities through the platform, but they also offer free getting started training and support. Ekos_brewmaster strives to bring a great customer experience. With this being at the top of their priority list, they focus heavily on the partnership with the brewers by providing free support and expanding the ekos_knowledge to their users. Ekos_brewmaster is the industry leader in providing management software to independent craft manufacturing businesses – currently focusing on craft beer and cider! Still growing in size, they partner with over 1000 craft beverage producers in over 30 countries to manage their day to day business in production, operations, sales and accounting. With just a few clicks of a mouse or swipes of a mobile device, they have made it easy for customers to organize, manage, and integrate information from every area of their operation into one easily accessible location.